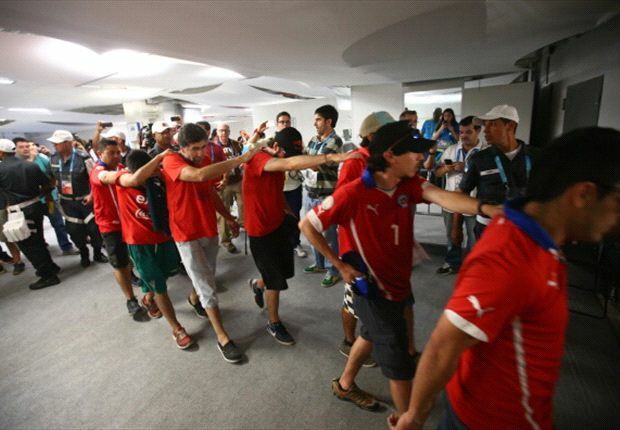 Brazil Federal Police have given 85 Chile fans who invaded the Maracana's media centre in the build-up to their team's victory over Spain on Wednesday, 72 hours to leave the country. The Police gave the deadline to the 85 ticketless supporters who were arrested after breaking into the stadium's media centre and trying to access the stands. Dozens of Chilean supporters had broken through a security gate and smashed through the doors to the centre before pulling down a temporary partition wall in a bid to reach the stands. The Police warns,in a statement, that if they fail to comply with the directive to leave the country after 72 hours,then they face deportation. “If they [the Chile fans] don’t comply with the notification [to leave within 72 hours], they will be subject to summary deportation according to our immigration laws” the Federal Police said in a statement. World football govening body FIFA is disappointed with the incident and says such "violent" acts will not be tolerated. On Sunday around 30 ticketless Argentina supporters scaled an outer wall and broke through a gate before being detained prior to their team's Group F opener with Bosnia-Herzegovina.